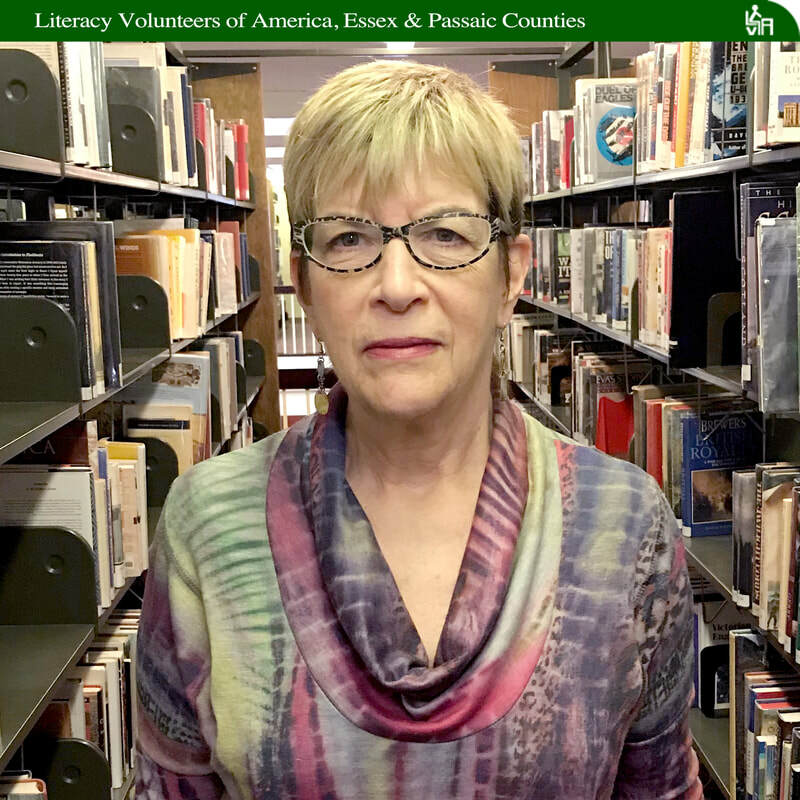 2017-18 - Literacy Volunteers of America, Essex & Passaic Counties, NJ Inc.
Everyone has a story, unusual, exciting, different. Many of them are just waiting to be read by others. 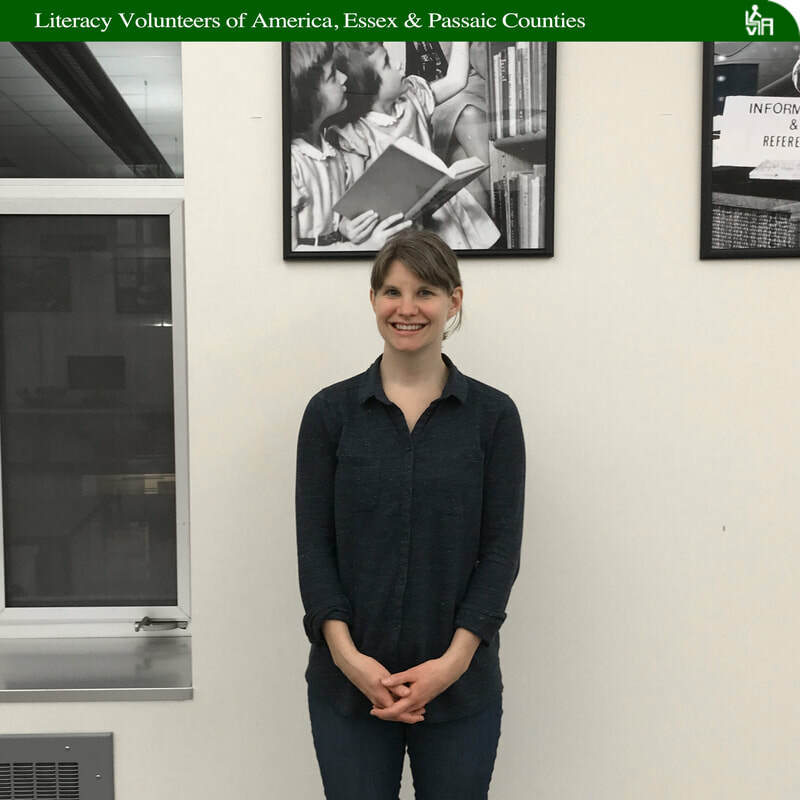 From the front lines in Bosnia to the front office in Manhattan, Literacy Volunteers of America tutors come to us with fascinating backgrounds. We are proud to share the highlights of these amazing individuals who bring their varied experiences to our students. Enjoy reading about people like the former missionary who provided medical supplies to remote villages, retired business people, lawyers, healthcare providers, college students, building for the future, who generously share their wealth of newly acquired knowledge, and even mothers whose role as primary as caregiver for their children willingly juggle home life, work as well as tutoring. 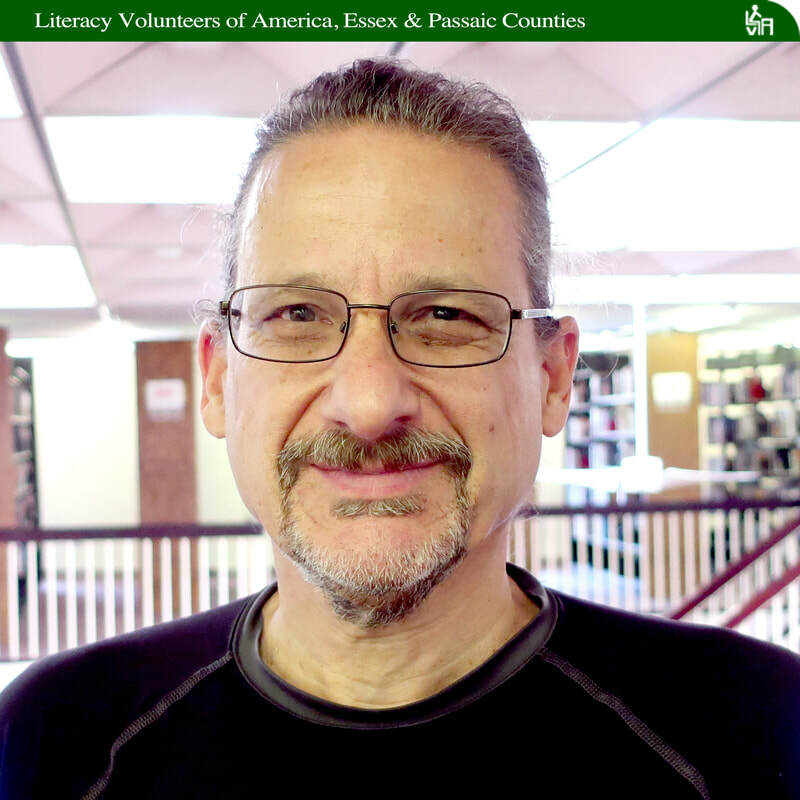 After a circuitous career path, Literacy Volunteers of America tutor Randy Budros has relocated across the country and returned to his teaching roots. Randy grew up in San Jose, California and earned graduate degrees both in sociology and education. This gave birth to his fascination with people and his unwavering dedication to teaching. He taught grad students at the socially conscious University of San Francisco for many years. Randy combines his teaching skills with his passion for helping his LVA students not only gain a better grasp of the English language, but of the United States and the political climate in which they are living. But, that is not all this transplanted Californian has done for the community. Randy and his wife Francoise, a Paris native, both work closely with refugees from the Ivory Coast and Colombia. Randy’s house becomes a local United Nations, as he and his wife host get togethers at their suburban home to include their adopted families. Currently they are working on helping a young woman enter high school. When they are not having these informal cultural exchanges at the kitchen table, Randy and Francoise help their new families buy clothes, food, and whatever needs may arise. In his spare time (I believe in Randy’s world there are more than 24 hours in a day), he is actively involved in SOMA. SOMA is a South Orange and Maplewood initiative whose mission is “to build a community that serves the needs of residents of all ages.” One of Randy’s current projects is advocating for criminal justice reform. 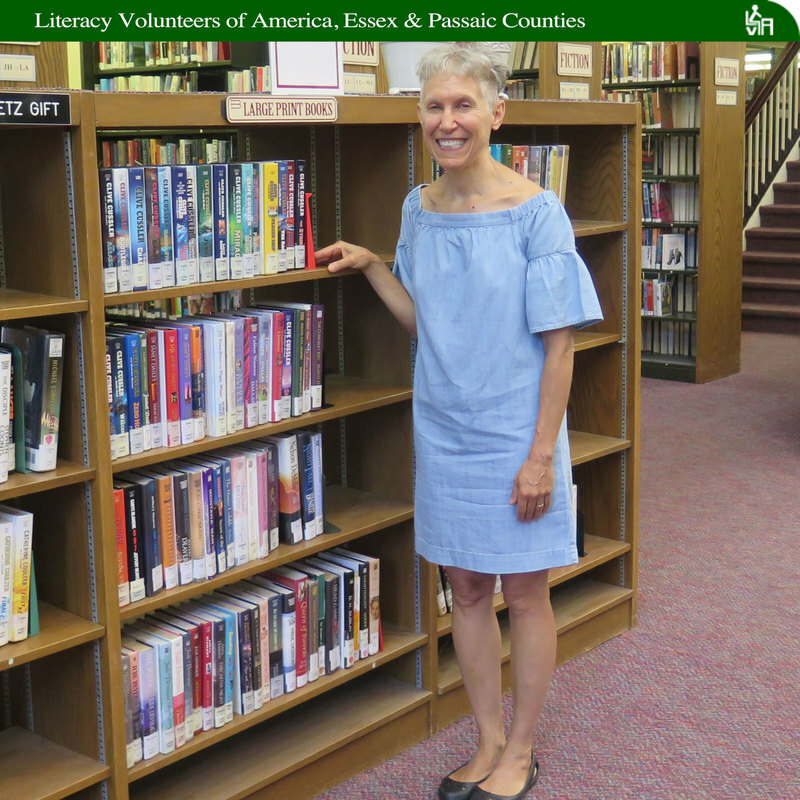 LVA tutor Nancy Pisciotta is a true unsung hero. Without any additional instruction, she figured out the right way to help her visually impaired student, Ana, succeed with ESL. Ana’s speedy rise from low beginner to high beginner in one year brought Nancy into the spotlight as a tutor. In 1988, while the kids were in school, Nancy went back to school herself to earn a Bachelor’s Degree in Early Childhood Education from Kean University. She went on to teach in West Orange for 24 years, focusing on language arts for first and second graders who had scored below the national average on standardized tests. “I loved teaching reading to kids,” she said. After retiring from teaching, Nancy thought she might tutor children in her spare time. Her interest in teaching was sparked again while visiting her granddaughter’s school for Grandparent’s Day. “In retirement, I missed reaching people in a meaningful way,” Nancy said. She drove over to the children’s Library at the Bloomfield Public Library and asked if any children needed tutoring. The librarian told her about LVA. Within a month, she signed up for tutor training workshops and got tips about working with adults. What she didn’t know was anything about teaching someone who was visually impaired. Her student Ana was not comfortable speaking English. But Ana needed to learn English if she wanted to speak to her daughter-in-law and grandchildren. Nancy made special accommodations to help Ana see the work in class by using Google images on her iPad to help with vocabulary and comprehension. She also uses a magnifier in the library to help see different images. Ana’s success has helped Nancy too. “I always walk away from here on my tutoring day feeling good,” she said. It struck painfully close to home for Mary Kao, when an elderly Egyptian woman pleaded with her for English language help. It brought back memories of Mary’s own mother, whose life had been made difficult by illiteracy. Mary’s mom could speak Ningbo, the dialect of her native Zhejiang province of China, and could converse in English, Hindi, and Urdu, all popular languages in India, where she raised Mary. But she couldn’t read or write in any language because, as a child, she was pulled out of school by her father. The Egyptian woman, a client in Mary’s hairstyling trade, also found life harsh in a country where she was functionally illiterate. It was a stark contrast to her life back home where she was a college-educated French teacher. 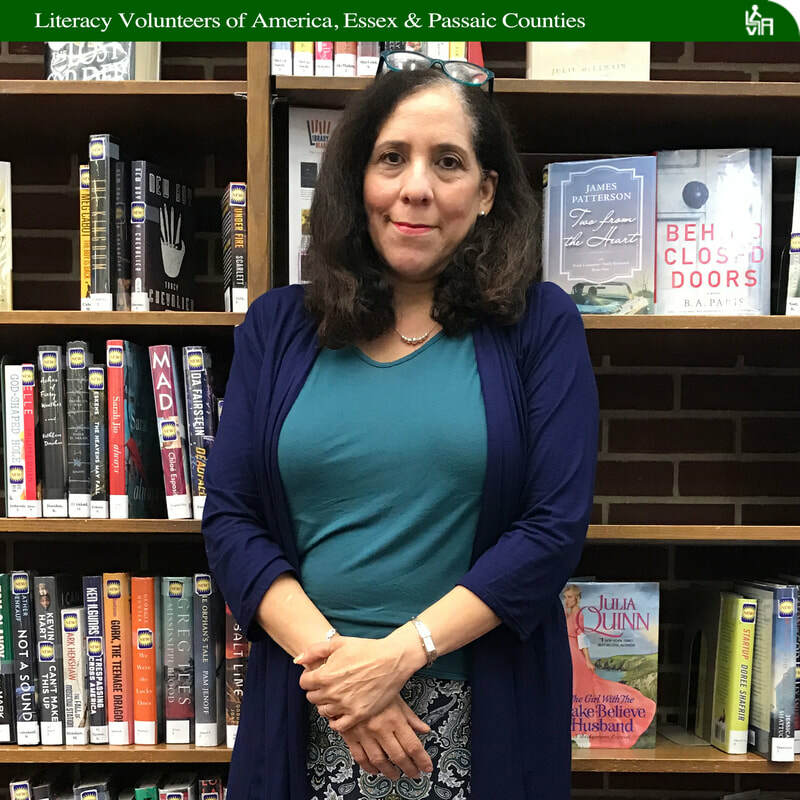 Mary went to the South Orange Public Library and was referred to Literacy Volunteers of America, Essex & Passaic Counties, which then had an office nearby at Seton Hall University. The woman enrolled and was assigned to a tutor. And Mary later became a tutor for the organization. That was 2001. Since then, Mary has gone on to become an advocate for adult literacy. 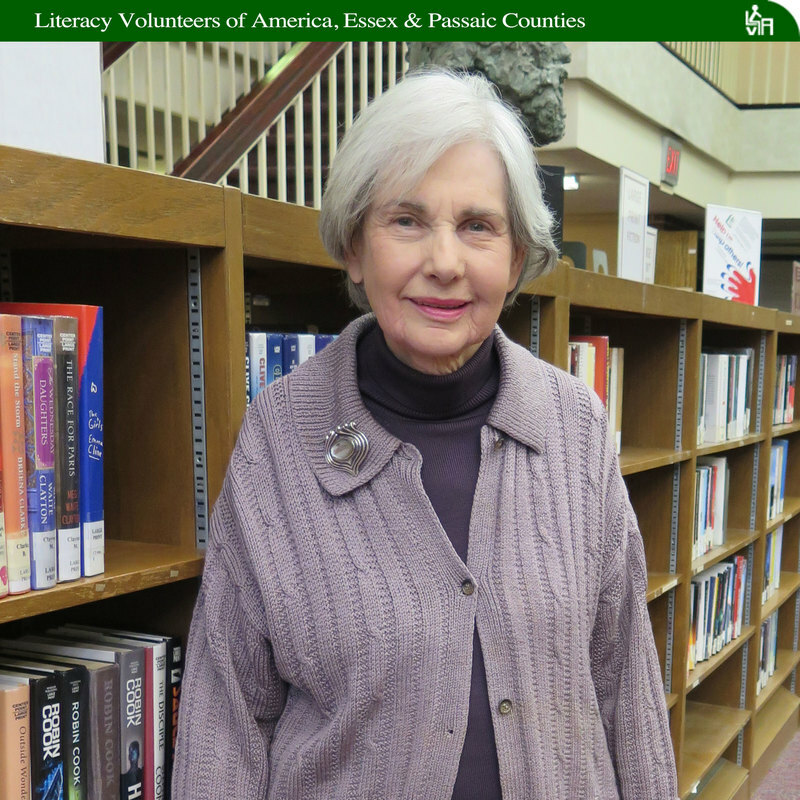 She’s been an LVA tutor for 17 years, one of our longest serving volunteers, was once named LVA Educator of the Year. She’s a trainer who coaches tutors and even recruits a few. And she’s a workshop presenter with a specialty in teaching literacy through photographs. In workshops, she emphasizes that tutoring needn’t be costly. Through the Learning Resource Center in East Orange, one of several educational depositories run by the state Department of Education, she gains access to thousands of photographs for a mere $2 per year membership fee. She mounts photos on index cards made from recycled paper and old file folders, uses the center’s paper cutter to shape her cards, and laminates materials there at a price of 25 cents per foot for lamination. In her spare time, Mary teaches origami, the Japanese art of paper folding, which she learned as a child on her father’s lap. 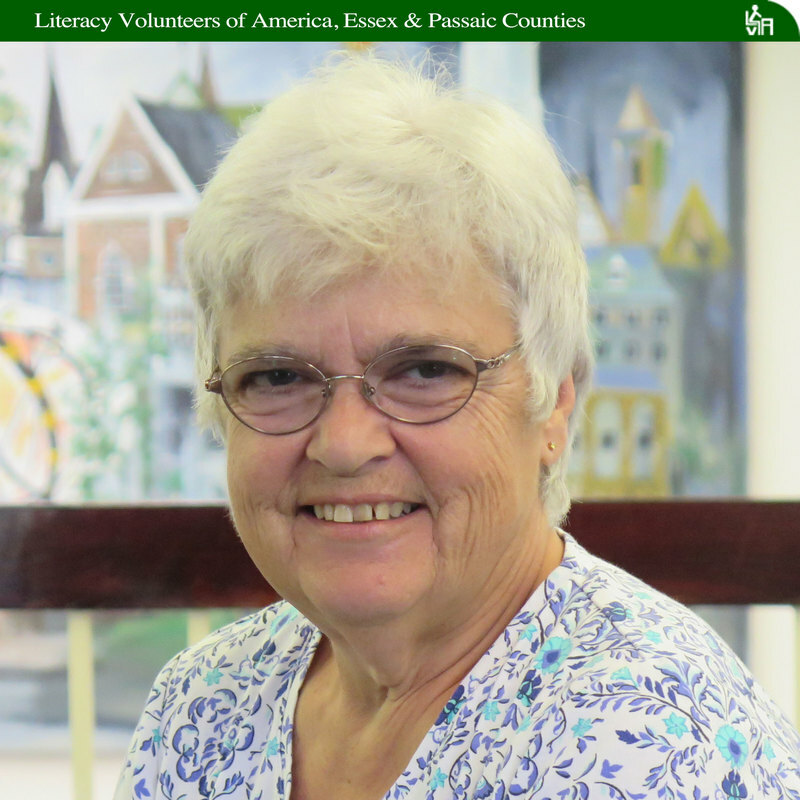 At twelve years running, Joan Scher is one of the longest serving tutors on the LVA Essex&Passaic Counties’ roster. 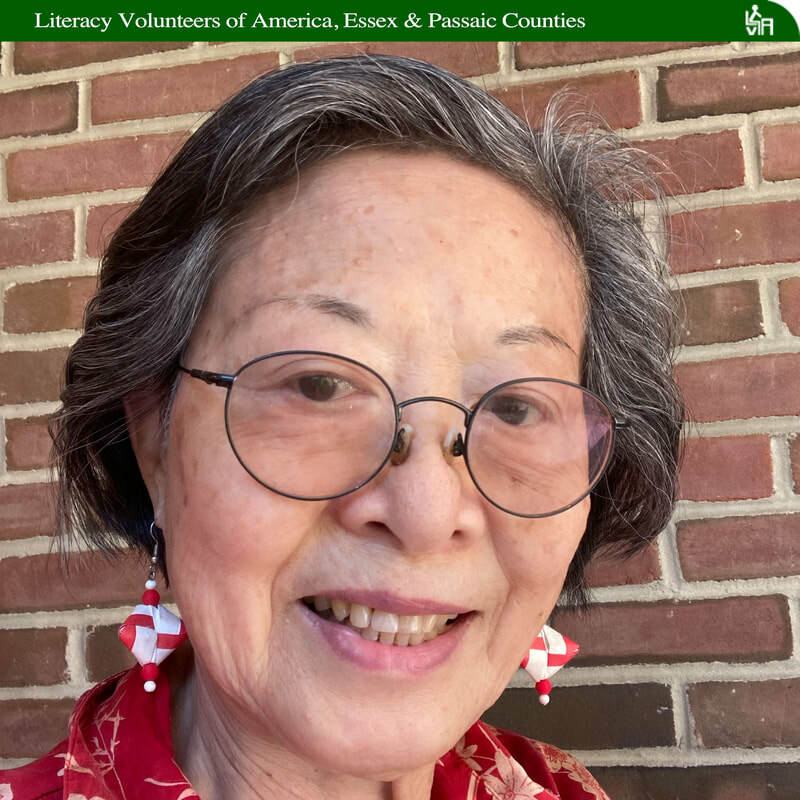 Joan’s first LVA students were learning English as a second language but Joan discovered, over time, that her real specialty is working with adults who never learned to read. Joan has been working with Clifford at LVA since 2012. Clifford was almost a non reader when he began tutoring with Joan. He could read words on signs that he encountered frequently, but he could not decode new words. Joan had Clifford select pictures as story prompts and encouraged him to speak a story into his phone. Clifford would copy that text into his laptop and bring it to Joan for them to make corrections together. Clifford’s writing won a contest sponsored by the New Jersey Association for Lifelong Learning and his work has been published in Journeys Near and Far, a collection of memoirs and poetry. A life-long learner, Joan takes classes in political science and literature, and draws abstract art on the computer. Joan has also painted on canvas but prefers creating digitally where she can create multiple versions and variations of images. Joan also enjoys traveling, particularly to New Orleans, where she visits family and takes advantage of the local music, food, and art. If Charles Bateman were a character in a novel, he’d definitely be the hero. He’s overcome every obstacle thrown his way and continues to look for new challenges, taking joy in his latest adventure as tutor with LVA. As a young man, he spent his summers in school. It wasn’t that he needed extra help. Rather, his mother wanted to keep him off the streets, so she signed him up for English and math classes in summer school. It continued on weekends too, when his mother sent Charles and his siblings to the library so she could clean the house. By the time he was 13, he had caught the reading bug and wanted to read every book in the library, frustrated that he couldn’t do it all at once. Eventually his guidance counselor said he had enough credits to graduate after his junior year in high school. But the counselor said he couldn’t take creative writing because that was for the college preparatory students. Instead, he was put in basic writing to fulfill his English requirements and ended up acquiring a lifelong skill in his efforts to stay engaged. “That’s where I learned to meditate,” Charles said. “Sometimes I woke up and found myself in another class; I had slept through my entire English class.” He ended up failing the class. After high school he went into the military and through a skills test found out there were lots of possible career paths, from motorcycle cop to teacher. After the service, Charles married and soon had a baby girl. When his daughter was four, Charles was working for the post office, and she started in Head Start. After becoming chairman of the Parent Advisory Committee in Head Start and also doing an exemplary job working with the children, the principal asked if he’d ever considered becoming a teacher. This really got Charles’ attention. But at the time he was battling with the post office over his large Afro. “I didn’t want to get a haircut, and to keep myself from getting into trouble I started college,” Charles said. He started on probation because of his high school records, but soared and was on the dean’s list all four years at Newark State Teachers College, which is now Kean University. From there Charles was offered a scholarship to Columbia University’s teacher’s college where he earned a master’s degree. He taught at the high school level and then went on to teach English and drama for 23 years at Essex County Community College. While there, he earned another master’s degree in liberal studies. He was fascinated how literature and law intersected, literature and science, literature and sociology. In addition to teaching he was also involved in helping create ONUS, Organization of Newark United Schools in the wake of the Newark riots in 1967-68. How did this learned and colorful man end up with LVA? His wife suggested it. He still works as a substitute teacher in the schools, but she said he should try LVA in his spare time. He’s been doing it about six months and loves it. He has two students, both work very hard and never miss a lesson. His students have entered the NJALL writing contest of New Jersey Association for Lifelong Learning. Bethany Blankenbeckler has teaching in her bones. Both her parents are teachers, and she is so obsessed with the craft that she can rattle off the names of educational philosophers such as John Dewey, Jean Piaget and Lev Vygotsky. But it wasn’t always that way. She struggled with reading as a child and as a result, ended up being home schooled rather than have her pegged as a special education student and possibly hurting her self-esteem. She worked as a mother’s helper, babysitter and camp counselor along the way. By middle school, Bethany and her parents decided to give private school a try. It turned out to be a great experience, and she thrived both academically and socially, saying she still has many friends from high school. ``I never wanted to be a teacher,’’ said Bethany, who ended up with multiple degrees and a teaching style guided by educational philosophers, in which she helps students learn by understanding their experiences and how that relates to learning. “I like to share my story with my students because it makes them feel more at ease,” Bethany said. After high school, she earned two concurrent undergraduate degrees at Arcadia University, one in elementary education and another in early childhood education. A teaching internship in a rural school in Uganda opened her eyes to teaching children based on their experiences. 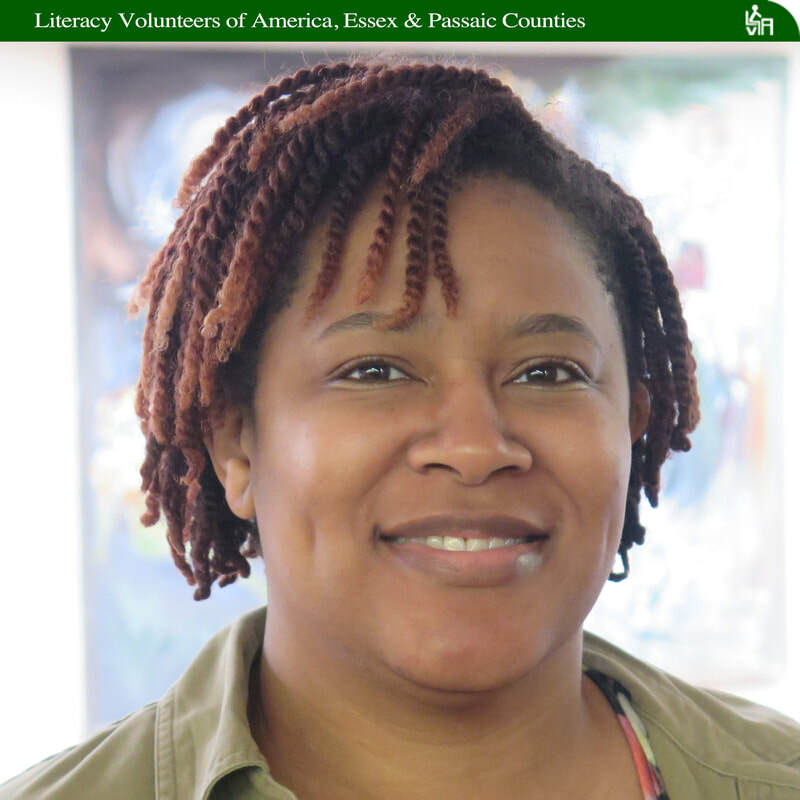 After her first child was born Bethany went on to get a masters degree at Hunter College in literacy in school age children, inspired by her own literacy struggles. Now she has two young children and is an early education specialist for New York University in Brooklyn. Bethany is responsible for professional development, sharing skills and strategies with teachers. Her emphasis is on the whole child, and she also runs workshops helping parents learn to teach their children long-term social skills. Bethany has been with LVA for nearly a year and is proud her students converse with each other and two have found employment. You’d think that pouring over news copy all day would be enough to send one scurrying from the printed page in one’s free time. Yolanda’s love of literature began early. Growing up, she read poetry, plays, and novels, both fiction and non-fiction. And she loved to spend time browsing through libraries. But she also knows that not everyone shares her passion; some simply can’t. “I have an uncle that could not read or write,” Yolanda said. “I knew there were programs for that.” But her uncle refused to enroll in a literacy program and, instead, relied on a cousin to make sure he understood the papers he signed. Yolanda majored in journalism in college and started her career as a reporter at a local New Jersey newspaper. Within two years she was the paper’s managing editor. She was hired by her current employer 20 years ago, working first as an editorial assistant, then as a copy editor, and later as an editor on the news desk. She is still an avid reader and has become something of a theater buff. Her editorial experience comes in handy when it comes to her students, who demand to learn more than just the basics. They have gone on to achieve goals like U.S. citizenship and, in at least one case, a job. Yolanda and her students are working with a book that deals with “how to speak like an American,” she said, a book that’s laden with idioms and opportunities for role play. “We take turns and we laugh about it,” Yolanda said. When LVA tutor Robin Sherman was growing up in New York, she had no idea what an impact her grandmother, affectionately known as “Nanny Frances,” would have on the rest of her life. Nanny Frances was also, as Robin described, “an original women’s libber.” Robin followed in her grandmother’s footsteps. Robin enjoys the diversity of the students and is currently tutoring a young woman from Bangladesh. “I love her. She is amazing. She is very appreciative of everything you teach her,” Robin said. Along with teaching Sharmin to read, write, and speak English, Robin also acts as her mentor. She encourages Sharmin to become a confident woman in today’s world. After just five months of working with her student, Sharmin has now landed a job on the sales floor. Robin has taken her role as a tutor to another level. She and two other LVA tutor/volunteers, are heading up a new tutor support group for tutors that will meet the fourth Tuesday of every month from 12:30 to 2:00 at the Park Methodist Church in Bloomfield. Robin, Carolyn and Artie had their first meeting on October 24. Robin commented, “It was great despite the inclimate weather. About 15 tutors attended, all brought their lunch and a great sharing of ideas was exchanged.” Robin encourages people to drop in. No advance reservations are required. When she is not tutoring, Robin finds time to pursue her other passion…guitar, which she began playing at 14 years old. One of her biggest influences is Eric Clapton. Robin is currently working on playing blues guitar and hopes to perform at her mother’s 90th birthday party. With Nanny Frances’s influence and Robin’s drive and determination, her mom’s birthday party is guaranteed to be a heck of a jam. “Once LVA students feel more empowered, they are better committed to learning,” said Diva, an LVA volunteer for three years. 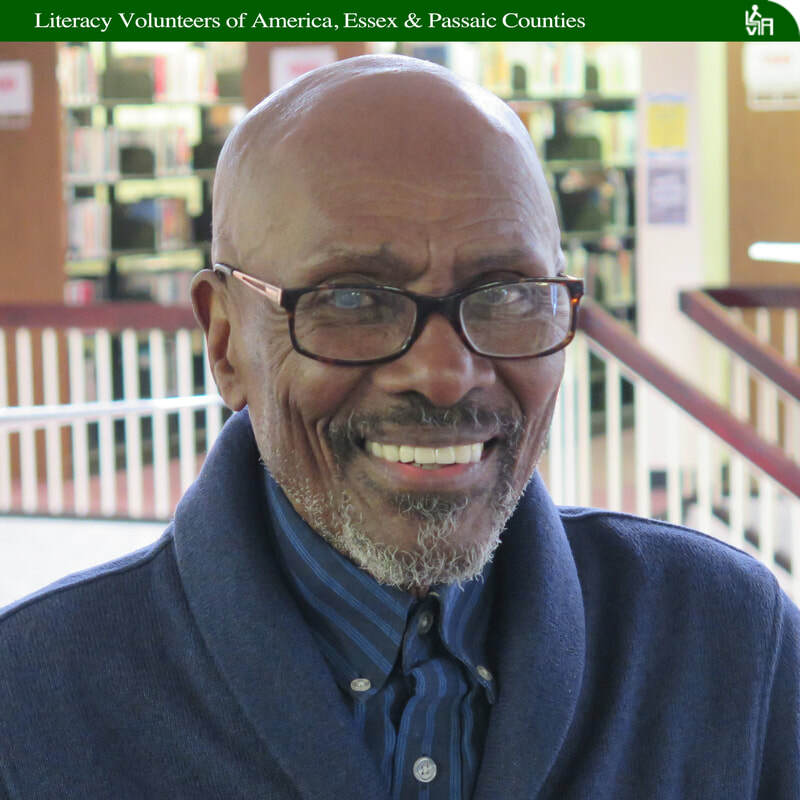 Volunteers have played an important role in adult literacy education for decades, often delivering services to low literacy students with few other affordable options. It’s a role that Diva had eyed for years; but her work schedule left her with little free time. In the busy Brooklyn District Attorney’s Office, where Diva worked on behalf of domestic violence victims, her workweek could easily exceed 70 hours. The student was a recent arrival in the U.S., a woman who traveled on the first flight of her life, bringing along two sons but regrettably leaving behind a daughter and granddaughter. Diva decided to proceed slowly. Diva and her current student, Sarah, from Morroco, have worked together for more than a year. She said she’s watched Sarah grow from an isolated young woman to one who shines with confidence as her command of English improves. Were Rachel not a tutor, one who helps adults improve their lives by teaching them English, she’d likely be doing something just as noble. Rachel has other interests too, of course. The New England native has a penchant for cooking, particularly Polish food, from kielbasa sausage to pierogi dumplings, and even kruschiki, a sugar-dusted fritter. These are skills she learned years ago from her Polish mother-in-law. Back at the library, Rachel regularly mixes the skills she picked up during her LVA training with techniques she’s developed on her own. For one, she finds that having a copy of Reader’s Digest handy is sure to spark a conversation among her students. That’s a win-win for any tutor and Rachel is not one to hold back when a student gets it. “When something goes extremely well for one of my students, I get very excited, jump around the table, and let my students know we are sharing an ‘aha! moment together,” she said. Four decades working as a fashion designer left Tova Narrett with enviable skills, among them the ability to present complex ideas and directions to laborers, designers, and producers who didn’t always speak English. Tova taught herself to communicate ideas clearly by using pictures, diagrams, and visual cues - - skills she would later draw upon as a volunteer. Tova remembers her first Basic Literacy student, a Nigerian woman who spoke English as her native language. The student quickly learned new words and together they used stories as a learning opportunity. With her second Basic Literacy student, a gentleman from Jamaica, Tova has had great success with a completely different approach. They use conversation as an opportunity to tackle the task of reading. She found him to be more a kinesthetic learner than an oral one. He successfully responds to picking up and arranging Scrabble tiles to form words and word families. Tova is extremely creative and, when it comes to her students, is constantly on the lookout for new, interesting and fun techniques to use with them. “I only have two or three hours a week and I want their experiences to be memorable,” she said. Sue Slater’s life changed dramatically in November 2015. 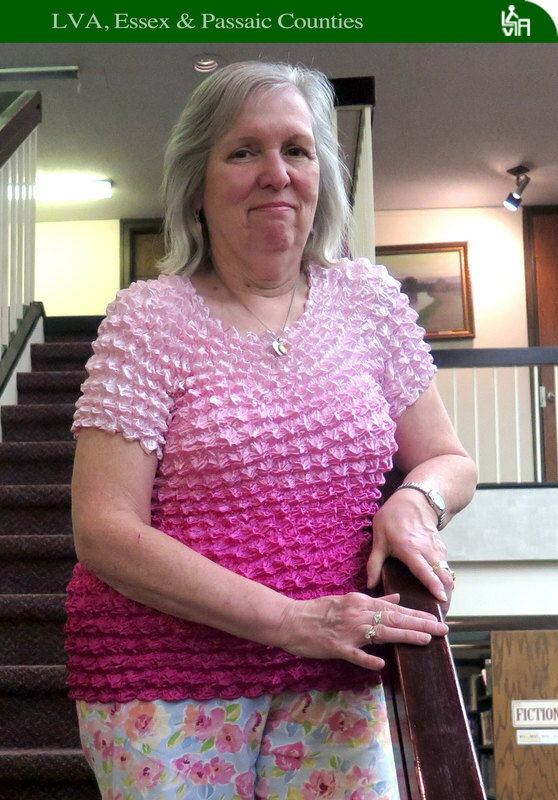 When she entered the door to Bloomfield High School to attend a civic showcase, an event where local organizations and clubs show what they can offer new members, Sue was twice blessed. She not only came away with a volunteer position but also a new family. “After retiring from work, I needed something meaningful to do with my life,” she said. 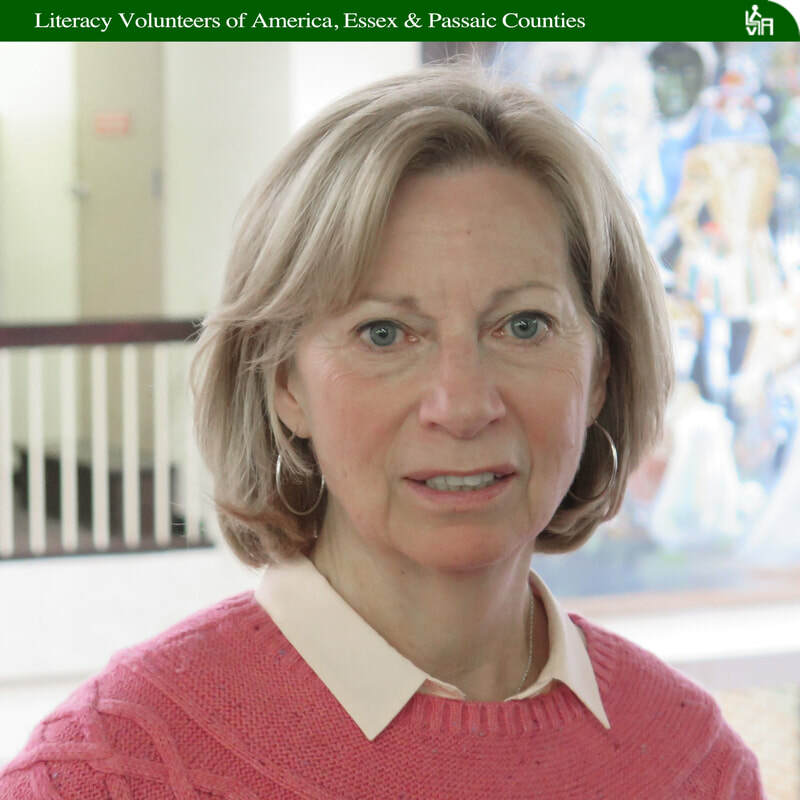 I heard about Literacy Volunteers of America when I was working and found that this might be something I want to explore. I knew I did not want to spend my retirement floating and doing nothing." Sue has now been a tutor with LVA for almost a year and a half. A former accountant and self-proclaimed introvert, Sue is comfortable with her group of four ESOL students and eagerly welcomes more to add to her roster. When asked how about how she sees herself now, Sue said, "I feel great. When I first started tutoring, my self- confidence and my ability to do new things was on the fence. I shortly found out I was able to shift gears. I feel very confident and very comfortable." Sue's students have all made great strides and she attributes their success to hard work on their part. Although, listening to her somewhat lively group at the Bloomfield Library, one might wonder if it is a social get together. That’s because Sue likes to keep her lessons both educational and fun. "The very first time I tutored, I thought I had ample material. Boy was I wrong. I now have more material than I need. I incorporate icebreakers, bingo, and Bananagrams into my tutoring. I like a variety of things to do and try to make lessons into a game form to make them more interesting."